I spent a few days last week at my sister's, and while I was there we went shopping for my seven-year-old niece's new backpack. She fell in love with one with an owl pattern, so I thought it would be fun to send her a card with the same look. Click here to see the backpack from Pottery Barn Kids, where I got my inspiration. 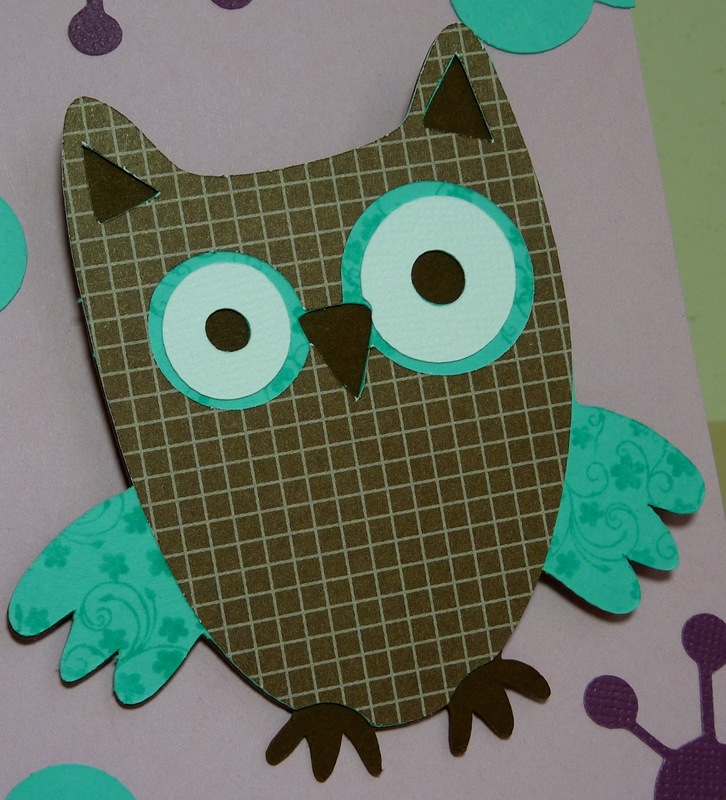 This adorable owl is cut from the Cricut Hoot 'n' Holler cartridge, at 3 1/2". I wanted a patterned turquoise for his wings, but I couldn't find just the right paper. So, I stamped the My Creative Time Spring Chicken Background with Papertrey Ink's Hawaiian Shores ink onto Hawaiian Shores cardstock. Perfect! I also attached this owl with an Action Wobble, to give him some fun movement for my niece. The fun purple shapes are cut from the Cricut Feeling Groovy cartridge, at 1 3/4" and 2". The flowers are cut at 1 3/4" from the 3 Birds on Parade cartridge. I topped them with buttons created with the Papertrey Ink Buttoned Up #2 Die. 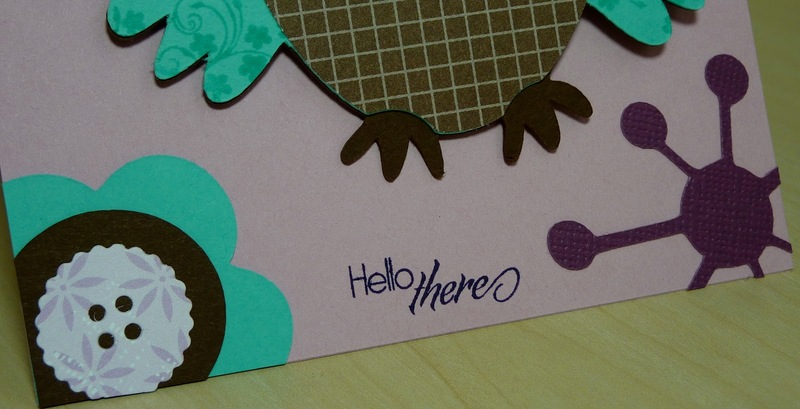 Lastly, I added a little sentiment from the MCT Teeny Tag Greetings stamp set. Katie ~ Okay your niece will just LOVE this! FUN, FUN colors you used! What a CLEVER idea on the wings! I LOVE how you cut off some of the shapes ~ which I need that shape now! Such a COOL card! The backpack is to CUTE too! wow! this is pefect, she is going to love it!!! Great card. One cute owl...I think my daughter would love that back pack too. I love the buttons and the colors are wonderful! cute card, love the pattern of the owl and nice background!!! Super cute! She is going to love the owl card!! 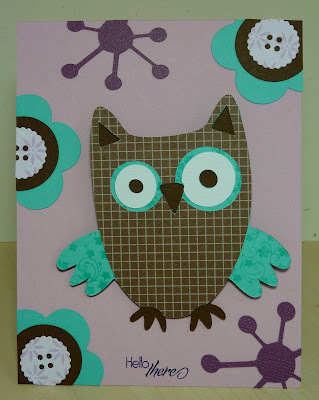 Super cute card... this is a perfect idea for a birthday card for my sister who LOVES owls :) Thanks for the inspiration!